Today is a very important day. Why is it important? This day marks the opening of the lecture series on The Great Means Expansive Buddha Flower Adornment Sutra. There may be people who have lectured on this Sutra in other countries, but I believe this is the first time that it is being lectured in any country in the West. Being the first time, it is worth our remembering it, and so is very important. One usually begins to explain The Flower Adornment Sutra with an analysis of the Sutra's title. However, this explanation of the Sutra will begin with an explanation of the Preface to the Sutra, which covers all the principles contained in The Flower Adornment Sutra. Once this Preface has been explained, it will be possible to understand the general meaning of The Flower Adornment Sutra. Who was the author of this Preface? 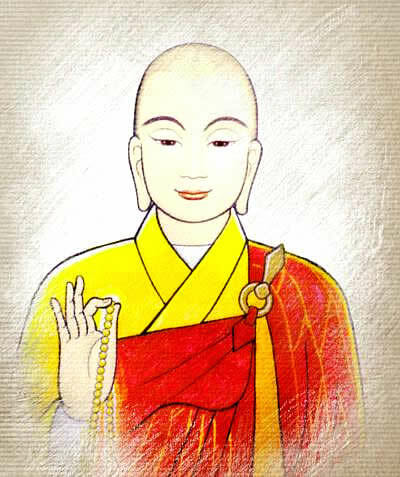 It was composed by "Avatamsaka Bodhisattva," the Dharma Master Cheng Guan. Before lecturing on the Preface, we will first say something about the Dharma Master who composed it. Dharma Master Cheng Guan was nine feet tall, and each of his eyes had two pupils. During the daytime, there was nothing especially extraordinary about him and he seemed like anybody else. At night, however, one could see a kind of light radiating from his eyes. Also, his two arms were so long that they extended below his knees. You should all pay attention to this: whenever someone has arms that extend below his knees, it is a very rare and special mark, an indication of nobility. Furthermore, he had forty teeth. Ordinary people have thirty-two, thirty-four, thirty-six, or thirty-eight teeth. The Buddha had forty teeth, and so did this Dharma Master. He was also a very fast reader. In the time it takes the average person to read a single line of writing, he could read seven lines. His intelligence was supreme. How do we know that he was Flower Adornment Bodhisattva? He wrote an extensive Commentary and Sub-commentary to The Flower Adornment Sutra, and lectured exclusively on The Flower Adornment Sutra. After his demise, an Arhat at the border between India and China one day saw two very young Bodhisattvas traveling in space. The Arhat used his spiritual powers to prevent the two youths in dark clothing (the young Bodhisattvas) from moving. Thereupon he inquired of the two young Bodhisattvas, "Why are you going to China?" to which the pair replied, "We're headed for Wu Tai (Five Peak) Mountain in China, to request the teeth of Flower Adornment Bodhisattva. We want to bring them back to our country and make offerings to them." Once he heard that, the Arhat said, "Fine. Go right ahead," and released them so they could continue on their way. Not long after, the Arhat himself arrived at Wu Tai Mountain and started telling everyone how he had encountered such and such a state. The result was that all the people got together and opened National Master Qing Liang's coffin, only to find that two of his teeth were missing. The two teeth were the teeth of Flower Adornment Bodhisattva that the two young Bodhisattvas had requested, and which they had taken back to worship! For this reason, Dharma Master Cheng Guan is known in Buddhism to have been a transformation body of Flower Adornment Bodhisattva. Since this Preface was composed by Flower Adornment Bodhisattva, it is of course the most excellent. That's why we shall explain the Preface before lecturing on The Flower Adornment Sutra itself.